This sophisticated ring from PANDORA is perfectly crafted from sterling silver and hand polished to give a dazzling finish. 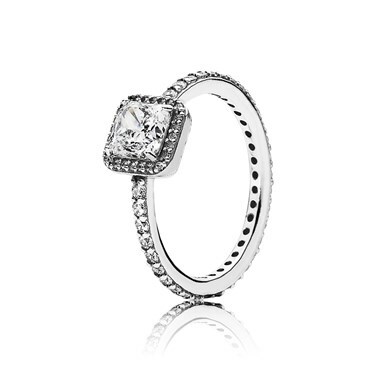 Sparkling cubic zirconia details complete the glamourous look. The perfect gift for someone special. Bought this ring as a birthday present for my granddaughter. Needless to say we are the best grandparents in the world,she was over the moon. Her smile was worth every penny spent thank you . Your service and delivery were ace as you always have been,needless to say we are constant customers. it is. My sixteen year old son bought it for his girlfriend who was trilled with it. It does size big so I had to send it back and exchange for a size smaller than I usually buy for the same finger. The ring is so sparkly I love it. Lots of compliments wearing this ring it sparkles very pretty and delicate. Bought as a present for someone. where is the size guide for these rings? what does 50, 55 etc mean? when will you get more stock in size 48 of this ring?